Latvia’s has a number of notable healing and holy springs. Many of them have folklore and associations which followers in the British isles will recognise. Such as Karalavoti’s The Seven Springs who’s waters were used by Sweden’s King Carl VII. Its waters were said to have worked on him when official doctors had failed and its waters remain a popular site. Flowing from the mouth of a lizard as the Kemeru Lizard springs. These are sulphur spring which have rejuvenating powers making old men young again! Deposits are associated with a number of the countries wells. The Bolēni or Bolenu Spring is rag well where offerings can still be seen in the form of ribbons tied around the tree above the spring, which erupts in a small pool at the base of the tree. A sulphur spring first recorded in 1739 at Barbele being spring is also associated with the tying of rags to nearby trees. Indeed it is said that when a Riga physician brought 10 ill soldiers to take the water, it too a day to clear the rags. However, in more rag traditions this would have been unwise and deadly perhaps, not for these soldiers as 9 of them were healed. Interest in the well disappeared after the amount of mineralisation was reduced by World War II. The well survives arising in a tank set into a wooden platform. Another sulphur spring was that of Baldone spring. Which was discovered when it was noticed cows drunk from it and so by the 1800 500 people a year took the cure as the town became a spa town. Yet despite pretensions to be a spa it is evident that those visiting it felt the need to involve themselves in a ritual cult. The evidence for this being rings, including earrings and coins being found in the basin when it was repaired in the 19th century. The spring flows from a pipe set into a small stone which is housed in an hexagonal roofed shelter. “At Turaida there is a cave which consists of sandstone and is called the “Good Man”. “six or seven springs emerge in the floor of the quarry… the building of the railway cut through the original St Helen’s Well and the present springs represent a post-railway emergence”. She states that there are signs of a structure consisting of a grey brick bridge spanning the conduit arch and two further arches have been infilled at either side of the conduit, but this do not appear to be visible now and perhaps have become overgrown. The spring does arise from stonework although it is difficult to judge whether these are natural or have had the touch of human hand. “one church of St Helen with one ploughland”. The next mention is that there was a fair there mentioned in a roll of fair belonging to the Borough of Thetford, this was also recorded in 1347 as a market or fair at Santon. However, by the time of the 1368 Archdeacon’s visitation it was absent from this very comprehensive survey. This suggests that the church was gone by then. Various excavations have revealed the remains of an apsidal church and that it incorporated Roman works into it, mainly tiles in its east end and north wall foundations. But was there a village? It appears not and so you may ask why was it here? The answer is quite clear it was here to capitalise on the spring, but what is surprising is that no adoption is apparent by the church perhaps this indicates that the church had indeed gone by the time of the real adoption of such springs by the church with appropriate masonary…it is difficult to tell. 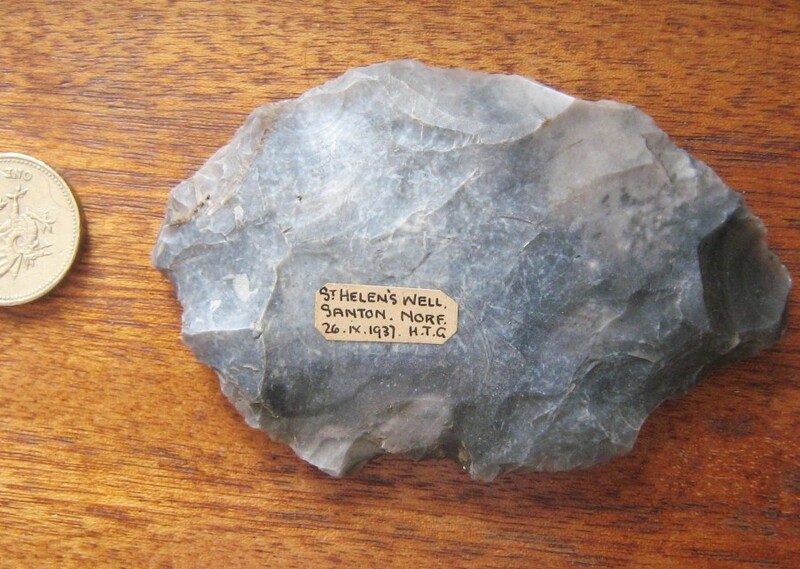 Examples of Palaeolithic flint tools have been found in the gravels at St Helen’s Pit. 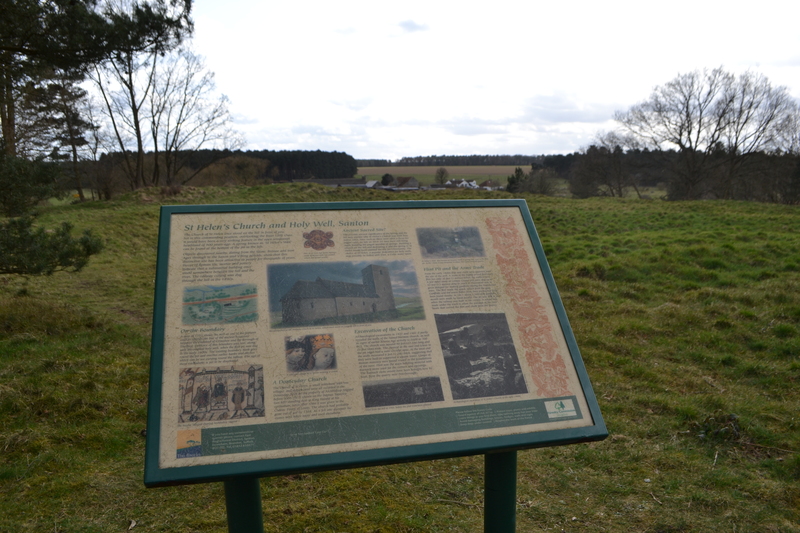 As at other sites in the Little Ouse valley such as Broomhill (another Trail site), these are likely to have been incorporated into the gravels after being washed off a land surface where they had been discarded, or having been drawn into them by the churning effects of frost action. Indeed other than St Micheal’s Well in Longstanton outside of Cambridge and Woolpit’s Our Lady have ever had only one! 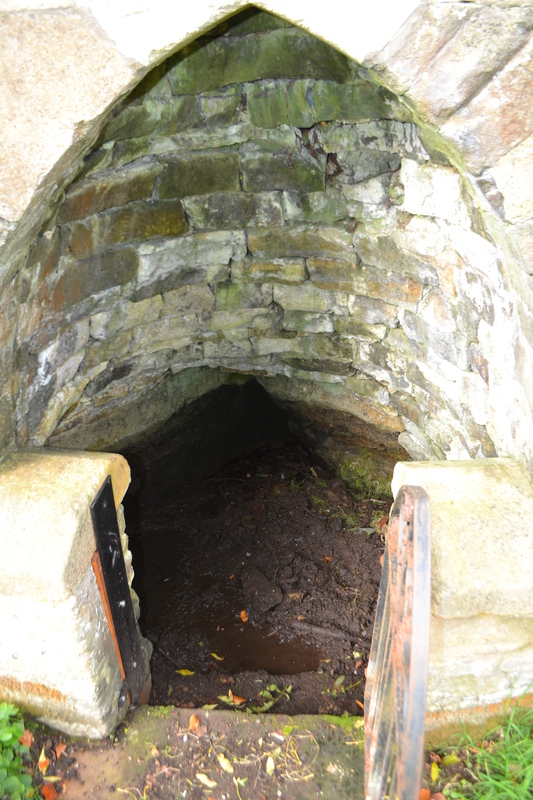 It is possible as there are a number of St. Helen’s Well which are rag wells up north that someone in the know decided to start it off here. 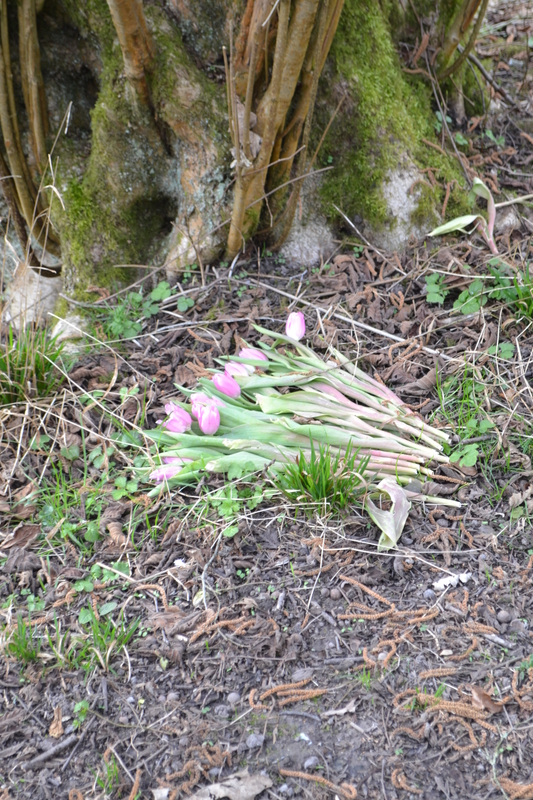 Whatever, someone had clearly thought the rag tree was an intrusion for upon a recent visit no rags were apparent being replaced by a bouquet of bright red tulips. It is indeed an unworldly site…climb down to it the trees give an eerie feel to it and even the sound of the train hurtling by cannot break the connection one can get to this peaceful place. 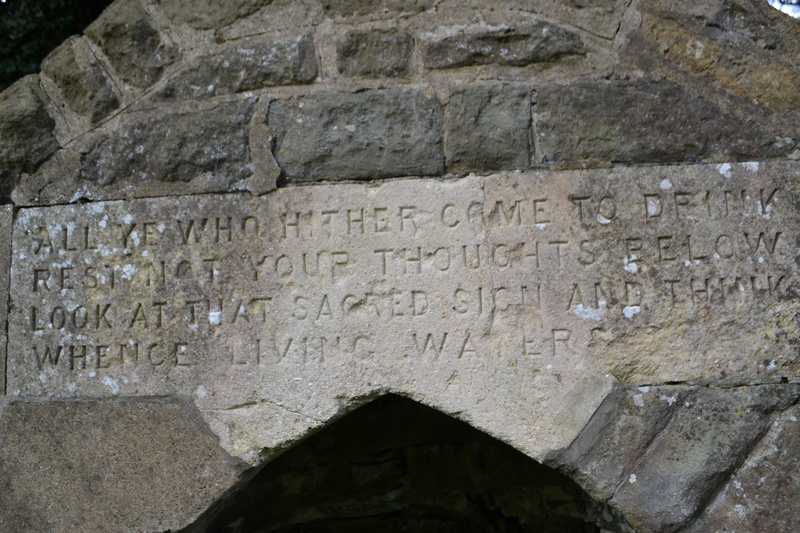 “All ye who hither come to drink/Rest not your thoughts below/Look at that sacred sign and think/Whence living waters flow”. Ashwell’s Wishing’ Well is one of those frustrating sites. It is clearly a structure of some importance, being one of the best built up in the midlands, but how significant is it? Peter Binnall (1935) in his Folklore of Wells notes that ash tree are very often associated with holy wells. The Ash was considered a sacred tree in Scaninavian countries and Britain. It was identified as Yggdrasil, the legendary tree associated with the god Odin. It is significant to note that at its roots was a spring where the Norns: Fate, Being and Necessity lived. They used the spring to water the tree each day and used clay from it to keep the tree white to preserve its life. However that does not mean that a well named after an ash is a culted spring. However, as Val Shepherd notes in her 1994 Historic wells around Bradford Holy Well Ash as well as Syke Well, Priestly which still has ash trees over it, as have Peggy Well, Riddlesden and White Well Harden. Hertfordshire has a significant seven springs in the town of Ashwells which is associated with a Roman shrine. 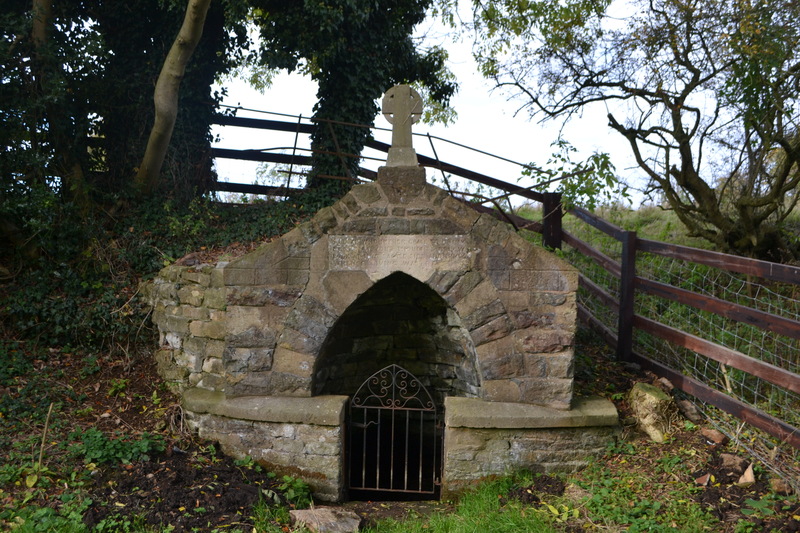 The ash above St Betram’s Well, Ilam Staffordshire was protected by a ‘curse’ which suggested that any person who harmed it would themselves be harmed. Indeed my research has suggested there is an Ashwell in every county but I have not been bold enough to suggest there would be any significance in these names…yet! Is this the well of the village? Over the time the name of the village has changed from Exwell in the 11th century; then Assewell, Ayswell, Aiswell (13th century; and then Aswelle, Ashewell, Assewell 14th century and possibly the spring in which the village is named after, although some authorities note is derived from O.E wiella for stream although that does not preclude the spring being the source of course. Furthermore, finding any associated tradition or history is impossible. The name wishing well is a modern term it appears unsupported by historical evidence. There is some local belief that it may have been a holy well, and a cross was once erected over the structure as there is today. When I first visited the well in the 1990s it looked a little forlorn, the cross said to be affixed to the apex of the building had gone and apparently fallen into private hands (I subsequently discovered its current whereabouts and it is safe!) It is better of today. The spring arises in a substantial stone well house. This is made of squared rubble with a dressed stone coping. It is like a small grotto-like covered niche with an opening to the front with convex curved walls each side. Above the arched doorway an inscription reads. 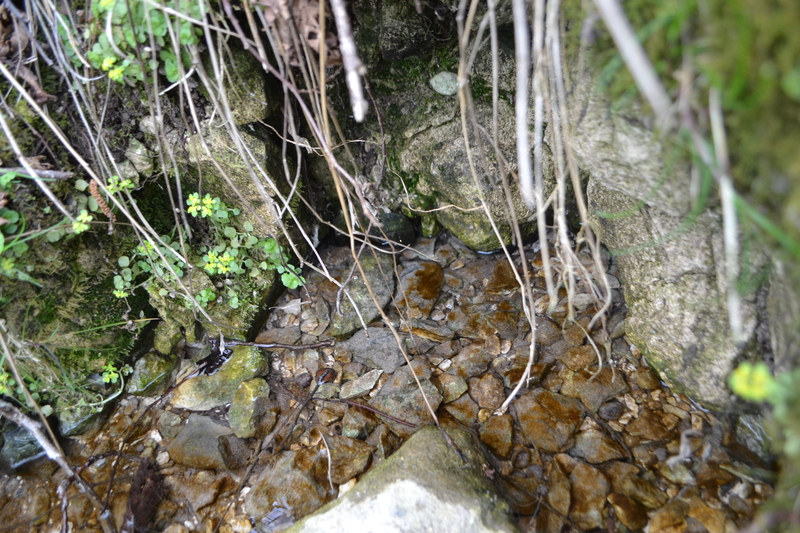 The spring fills a small pool at base of niche within in the rockface showing this is a spring not a well. 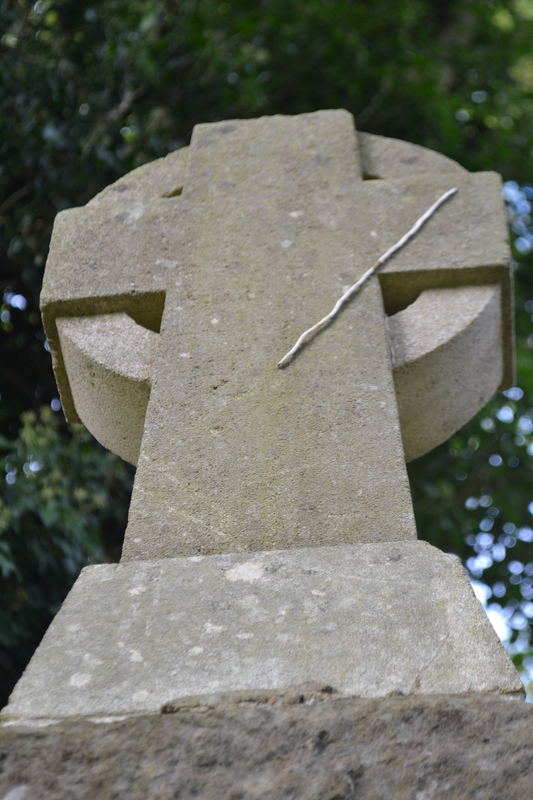 The cross has been restored as well. In conclusion it would suggest that the spring’s development was an attempt by a Victorian clergymen to both gentrify the site and as thus built a proper well house with its legend. Was there a High Church tradition in the village in the 1800s not that I have so far discovered?